We talk about a rigid fork if the fork is not equipped with a suspension system. By waiving the comfort of the suspension, a fork is more durable, is less subject to wear and tear and also offers a lower system weight. On the road bike there is traditionally almost no other variant than a rigid fork. But also in the MTB segment, there are many advocates of a rigid fork. It is suitable for everyone who can waive the comfort at the front problem-free and mainly for all racing enthusiasts among the mountain bikers, who can save a lot of weight this way and who like the direct resonance of the ground at the front wheel. Rigid forks used to consist mostly of steel or aluminium. In the last years, carbon forks were more and more widely spread. Since they are slightly bent forward, they even offer a little more comfort. But it is definitely not comparable to a suspension system. But instead the "much" lower weight scores here! The time and money spent on maintenance is also not necessary in this case. A steel fork is not as rigid, but instead it is just a little "flexible". An aluminium fork is extremely rigid, but does not provide any flexibility at all. road bike segment and at extremely light MTB hardtails. Which fork variant is the right one for you? For example for small road bikes which (still) roll on 26" wheels, 26 inch rigid forks are being used. They also often are still found on touring bikes since luggage carriers and bags can be mounted. For 26" fatbikes, the rigid forks are still mostly used, but carbon is increasingly used here also. Therigid forks for 29 inch bikes are often made of carbon. They are used e.g. for fatbikes and extremely light mountain bikes (fork weights around 700g). The comfort is really secondary in this case. The carbon forks are just perfect for fast cross-country trails. You can get them for thru axles and for classic quick releases. Do you wish a classic road bike steel fork or a light weight of carbon for your road bike? Then you are dead right if you decide on 28 inch forks. 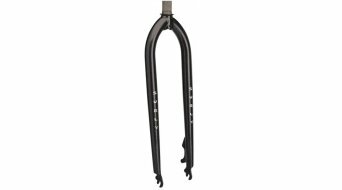 The carbon forks are available with head tubes of alumunium or for a light structure head tubes of carbon. In most cases, the axles are equipped with quick-release levers. But more and more lynchpins are offered, which makes sense for heavier riders and whenever disc brakes are used.